Forum Description: Everything and anything to do with the RSV. ... Aprilia's biggest seller! So after 6 weeks of glorious RSV ownership I think its time to look at making some changes to my new baby. I really like bikes having twin exhausts, one on each side. It just looks ballanced and right! So just wanted to ask the collective wisdom what i should be keeping my eyes open for! any others i should be looking for? Who else has done it and any advice? Costs? Anyone selling?? Most big names make a twin system for the gen1 or should I say did make a system. So budget options...falco headers ..for some these bolt straight up maybe wrap the headers where close to the bellypan,some have had to add a bulge or 2 to the bellypan...??. Then there are any number of purpose made twin systems..Leo Vince,akrapovic,renegade,Harris,arrows,sil moto ,tigcraft,etc etc.some are for 99-00 models others are for 01-03 ..different suspension linkages dictate the clearance. For any twin system if you want pillion pegs you need to mod the left hand peg or buy a set of pillion pegs with the hangers..very rare. Or no pillion then just hangers..gen 2 doesn't fit as different bolt spacing. Also gen 1 single seat subframe may not have bolt holes on the left side....eiter add rivnuts or change subframe to dual seat version. What ever you decide twin systems make a great noise and you'll have fun setting off car alarms as well as a nice 10bhp hike in the midrange and a bit at the top. The budget conscious stick with a single can and a moded collector to get nigh on the same results. Cost wise falco headers can be picked up for 30 quid dual systems go from 175 upwards you just need to be in the right place at the right time. thank you! Thats a good run down! I should have added its an year 2000 bike. I will have to just keep my eyes open then i guess but its good to hear that there are so many standard systems out there! Always happy to share too Hehee! Whose is that? Lush man! Does this standard collector to -split have the same mid range advantages as a full twin system? I'm assuming not. Life aint about the destination, life's about the journey. That's why we ride! Would do if you get your collector modded and a forza chip I am getting to like the high level twin cans would prefer proper twin pipes but if a set came along at the right price ??? Basically no I don't think it offers any power gains at all..but combine it with a modded header then yeah. image shows twin hi level gp carbon silencers.Price is £450 and includes twin pipework plus shipping. Thats not to far from me! I bought a spare set of fairings of him and he was a great bloke. Sadly he is having no joy selling the bike so might be worth making him an offer on his pipes as they were lovely! 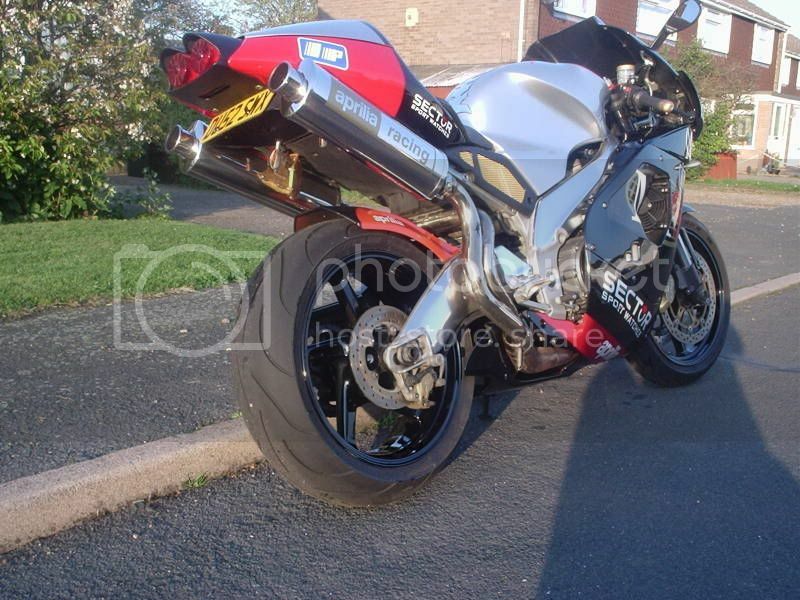 mate, I MAY have my Arrow SBK 2-2 sytem for sale in the near future if i cant get a set of link pipes made up!!!! Go big or go home! ! ! A big learning curve that never ends ! I dont know what year they were, I just bought a gen 2 full system but not sure what year it was off ! Id of thought 06 onwards. It was a bit of a faf about getting the rear header in place and tacked into place but not a bit job tbh. please pm me if you're serious about selling the arrows as those could be just right. I also have large feet but don't think the pipes getting it the way of my heels will really be my limiting factor. 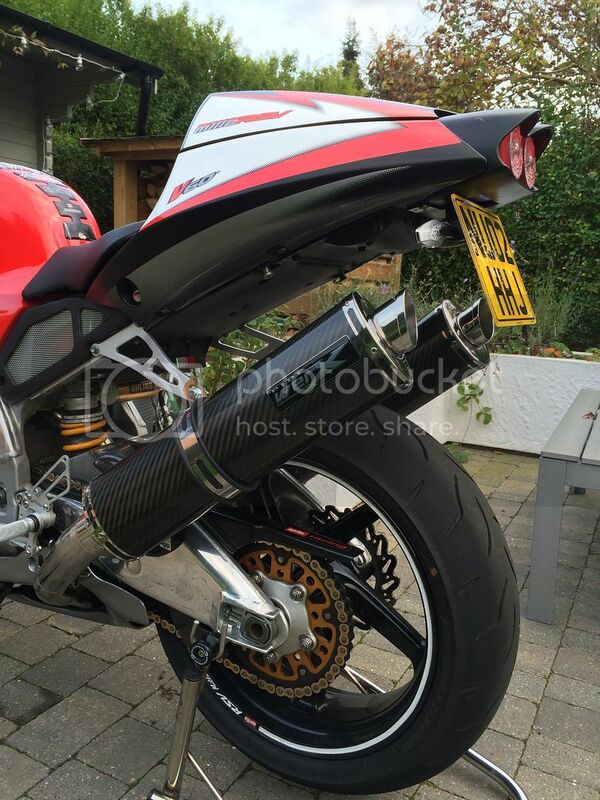 Quick question for those who put falco dual exhausts on mille and use their mille on track. Are exhausts high enough not to touch the ground in the corners? I've just bought these off ebay fir my 2002 gen 1. Also bought these aswell, haven't a clue if if will all go together. Ok, i haven't got any of the parts yet but hope to have them by end of the week. Any pics of yours. And will i need link pipes. 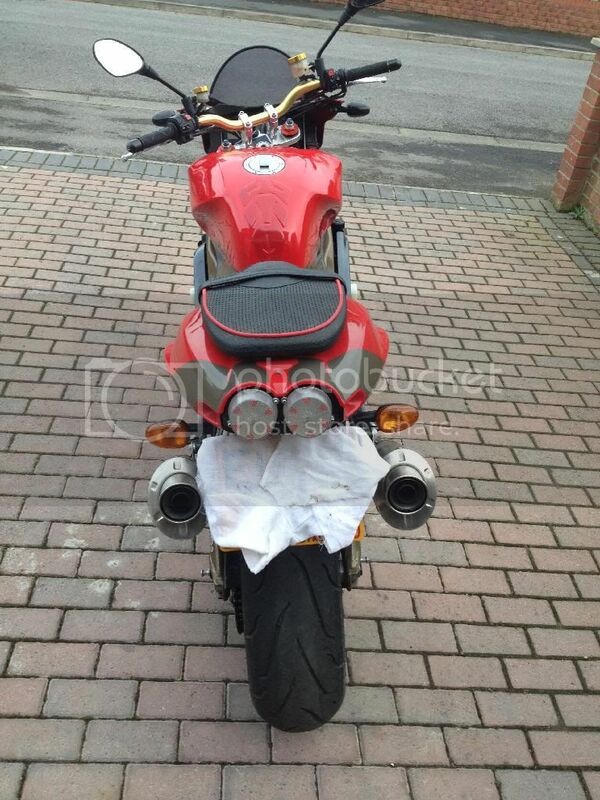 You will need link pipes and on my tuono I think ive got mille rear hangers and they fit. Cheers mate, theres some link pipes on ebay at the moment. Just bought these off ebay so hope i have enough bits to do the conversion now. Now I have read (sort of)on here about them. Is it you that makes or supplies them? How much are are they? What is it? Must be something to do with the manifold? Thanks for your help. the collector is where the 2 downpipes merge ,its modded to mimic the flow of a dual system. If you have a single can system on your bike a modded collector should be the third thing you buy for it. Other 2 being changing the stand and Johnboy's excellent uprated power cable set. If you're keeping the single can you NEED the modded collector,only exception to the rule is if you fit a complete twin can system. I have a gen 1 tuono with 2-2 akrapovic evo system but with custom link pipes into scorpion stubby cans. I am.toying with going 2-1. I am just not sure does sound the dogs but not convinced. are you thinking modded collector system or a proper 2-1 full system? Think a modded collector be best. But not sure. I have a gen 1 titanium exhaust but don't have 2-1 headers and mid. Your that guy who had the tuono with the Evo5 system aren't ya..?? Akrapovic evolution system with Pipewerx custom cans. These were forced on me by PaulW ..
Are there any purpose build single exhaust full systems and how do they compare with the double can full systems? Because I think on the more slender/cleaner looking Gen 1 98-2000 single exhaust looks alot better I don't really know why people want duals so bad on them? They must be a fair bit of weight than singles,More money,Twice risk of damage,If there is really a big power difference yeah. I've got a Ti gianelli single can with link pipe thats needs repacking,If it produces 99% same midrange and peak bhp as the dual gianelli with one of redrats modded collectors i'm 100% prefer it to a double system,If I had both to choose from regardless of cost.